Three years ago I read a book titled “The Marathon Monks of Mount Hiei” by John Stevens. The book focuses on the Tendai Buddhist monks who complete Kaihōgyō, 1,000 days of long distance walking, meditation, and prayer over a 7-year period. Kaihōgyō is by far more demanding than any modern-day athletic endurance event, so demanding that the monks are required to carry a knife and rope to kill themselves if they fail. Since 1585 when they started keeping records only about 52 monks have successfully completed Kaihōgyō (one monk has completed Kaihōgyō twice!). Their motivation to attempt such a grueling feat is to achieve enlightenment and become a living Buddha. I was so fascinated by the marathon monks that I wrote one of my early blog posts about them. I have wanted to visit Mount Hiei and the monastery where they live since I read the book. I didn’t have time to travel there in 2015 when I ran the Tokyo Marathon. Last week I returned to Japan and visiting the monastery on Mount Hiei was at the top of my list of things to see. Little did I know I was going to see a lot more. Mount Hiei is over 2700 feet high and straddles two prefectures – Kyoto Prefecture and Shiga Prefecture. It is a beautiful mountain, covered in trees and flowers, and home to a wide array of wildlife. The monastery on Mount Hiei was founded 1200 years ago and has been designated a UNESCO World Heritage Site. Traveling to Mount Hiei from Kyoto was a bit of an adventure. I hired a Japanese guide, Maki, to help me get there. We went by cab to a train station where we took a train out of Kyoto. 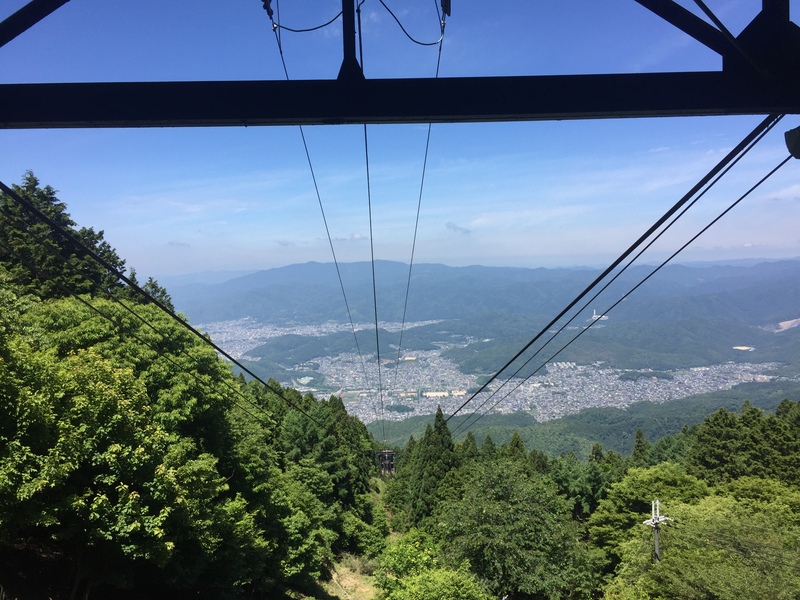 Then we transferred to a cable car followed by a ride on a ropeway (an aerial tram) and, after a short of walk, boarded a bus for the last part of the trip to the Mount Hiei monastery. Along the way we were treated to breathtaking views of Kyoto, Lake Biwa, and Lake Shiga. I even saw deer grazing along the cable car tracks. As we walked around the monastery complex, Maki explained the history and significance of each building. There were temples and shrines of all sizes, though the main temple, Enryaku-ji, was by far the most impressive. Walking around the complex was not an easy stroll. It was more like a stair master workout – between each of the buildings, we were going up and down very steep stairs. Maki mentioned there is currently a monk in the midst of Kaihōgyō. She lives along the route that the monk takes into Kyoto to visit the temples and shrines there. Her mother has seen the monk on his walks. 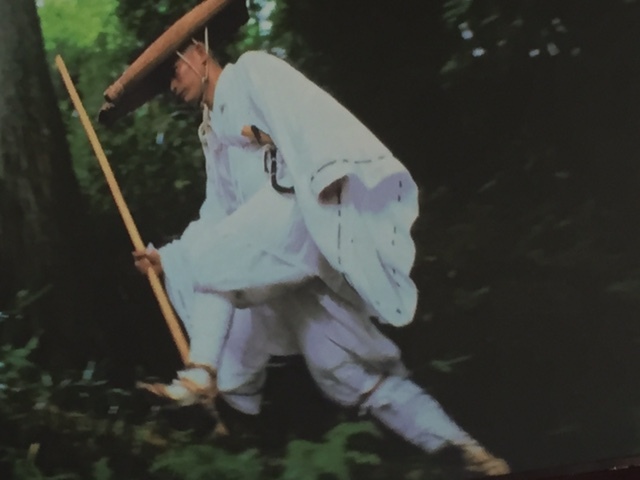 I was thrilled to visit Mount Hiei but the thought of possibly seeing a marathon monk was incredible. It is not something that happens every day. Maki found out when the monk would be passing through Kyoto the next day. He would be stopping at one of the temples I planned to visit, the Kiyomizudera Temple. I decided to time my visit there so that I could see him. My Japanese guide for the next day, Miho, was very agreeable to helping me see the monk. We arrived at a location we expected the monk to pass on his way to the Kiyiomizudera Temple. Miho checked with the surrounding shopkeepers. One confirmed the monk would be coming past where we were. After waiting nearly 45 minutes in the hot sun, we decided to keep making our way up the hill to the temple. We stopped again halfway up where two roads intersected. We weren’t sure which road the monk would take to the temple. Another shopkeeper there assured us the monk came this way and had not yet passed by. Again we waited. Unfortunately marathon monks don’t wear tracking devices like runners do in races. I had no idea where the monk was or when he would come. I decided I was not going to see the marathon monk and we resumed our walk up the hill to the Kiyiomizudera Temple. The monk passed so quickly that I was unable to get a picture of him. This photo was displayed in the cable car station on Mount Hiei. There were hundreds of tourists around the temple grounds. Kyoto is one of the top destinations in Japan for both Japanese and foreign tourists, and Kiyiomizudera Temple is one of the most visited sites. 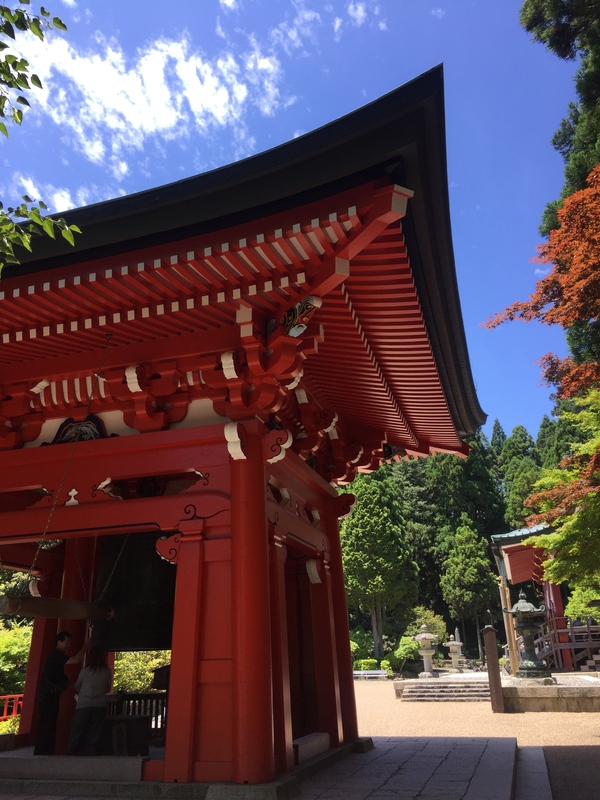 We stopped at several shrines and smaller temples as Miho explained the significance of each. Finally we reached the main temple, Kiyiomizudera Temple. As we stopped to look at a Buddha who protects businesses, there was a flurry of activity behind me. I was pushed aside by group of 10-12 men who were surrounding the man I recognized immediately as the marathon monk. The group stopped in front of another Buddha where the monk knelt and began a chant. After about 2 minutes, he got back up and continued on his way, still surrounded by the men who cleared a path through the crowd of tourists. He moved swiftly and quietly, except for the rhythmic sound of his wood walking stick hitting the ground. I was so amazed that for several minutes I could not speak. I had never expected to be able to see a monk in the middle of one of his “marathons”. It was a magical moment, one that I will never forget. That evening I enjoyed dinner at a traditional Japanese restaurant with low tables and mats covering the floor. 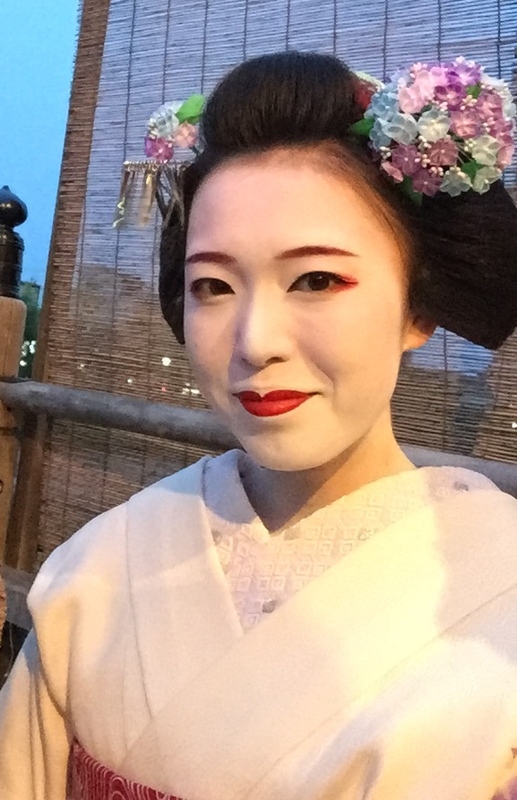 A Geisha in training was entertaining us during the meal. I spoke to her through a translator about seeing the marathon monk. We started to talk about my own running activities, including the 2015 Tokyo Marathon. 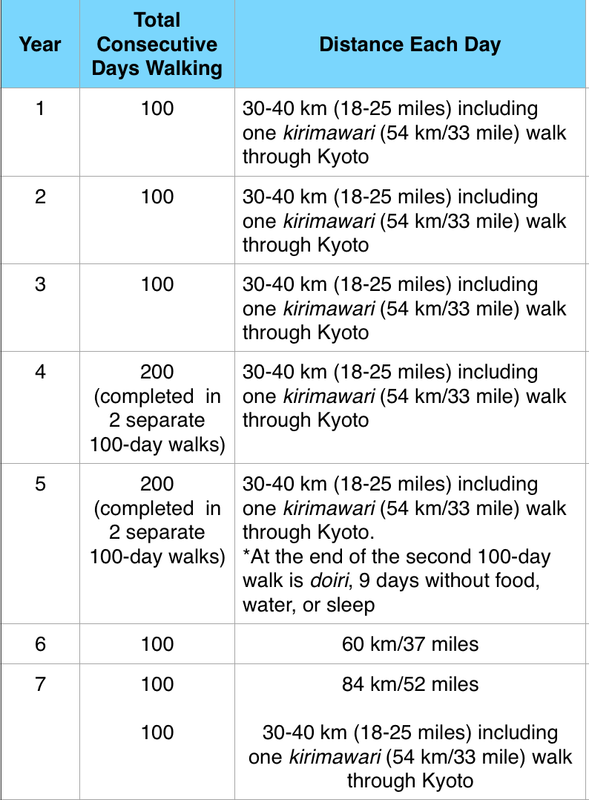 The Geisha, it turns out, is training to run the Honolulu Marathon as preparation to run the Kyoto Marathon. It seems as if I can’t escape running even when I take a trip that doesn’t include a race of my own. When I got back home, I was able to find out more about the current marathon monk, Kogen Kamahori. He is nearing the end of his Kaihōgyō and expects to be finished this fall. In 2015 Kamahori completed doiri, 9-days without food, water, or sleep, during Year 5 of his Kaihōgyō . (Doiri translates to “living death”. In fact, many monks have died during doiri.) There were several news stories about him when he finished. For anyone who wants to experience some of a marathon monk’s course on Mount Hiei, there is the Mount Hiei International Trail Run. Runners can choose to run either 50 miles (with 5500 meters vertical) or 50 km (with 3700 meters vertical). After I walked a bit on Mount Hiei, I can tell you that it would a challenging race. (Here is a link to an interesting blog post by someone who completed the 2016 race: http://alpine-works.com/2016/06/mt-hiei-50k-international-trail-run/.) Runners have to be able to follow the whole trail without getting lost (even marathon monks sometimes get lost and they live there). Among the equipment the runners must carry is bear bells. I was tempted to take up ultra running so I could enter this race but common sense tells me this is a race for stronger runners than me. Instead of running the ultra, I would be happy to return to Mount Hiei and hike down one of the trails from the top. I can’t imagine what I would see if I did that! Documentary Educational Resources put together a fascinating film about the marathon monks. Here is a preview of the film. It definitely was one of the most incredible experiences in my life. I was only in Kyoto 2 days and they just happened to coincide with this monk’s journey into the city. This was not something I could have planned ahead of time. But it unfolded as if it was all pre-arranged.